Is the Rental Market Cooling off? On our tour, we had a behind-the-scenes look at four new projects, only one of which was finished. The unit we toured in the finished project was being rented out as an AirBnb. The second project was a relatively small apartment building; the owners were a group of basketball players from a different city who had invested in this building and were rehabbing it. The third project was a repurposing of a large warehouse space into residential. The owner told me that this project had never been viable until now and that this was the first project of this kind that they had done. The last project was a huge 21-story former office building built in 1925. Again the owner of this building told me that they usually do commercial work and that this was their first venture into residential. 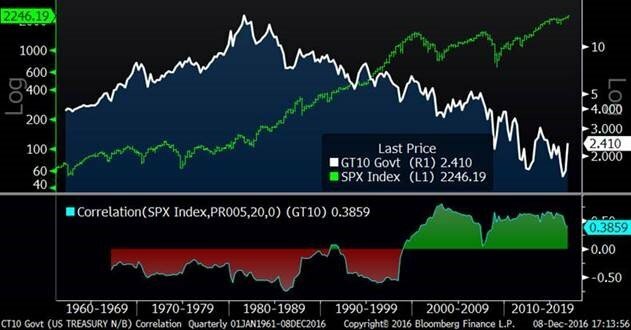 The Positive Correlation of Rates and Stocks, Uber, and Rising Death Rates. I pondered whether I should hold back this blog, since it will make two in a week, but my guess is that readership will be low next week given the holiday. I am hoping some of you will find the first bullet point interesting enough to quiz the family with during Thanksgiving break. No Grexit? Where will all the sidelined cash go? Recent Market Activity: As I type this blog, the stock market is now back to within about one percent of its all-time highs. As is usually the case, the biggest issue people were/are fearful about (Greece) has not derailed the market. The events of the past few weeks, from a market standpoint, have been completely erased and stocks are right back to where they were. It will be interesting to see if the market will move to new highs if fears related to Greece fade. I came across the chart below, which shows the implied likelihood of a “Grexit.” If you compare this with the S&P 500 (bottom) you will see a correlation between the implied “Grexit” odds and the U.S. stock market. Now that we have entered the third quarter, I thought it might be interesting to look back at the performance of different market sectors. Year to date, the S&P 500 is roughly flat and the typical (median) stock is down about one percent. On a sector basis, as you can see below, the market has been quite bifurcated. 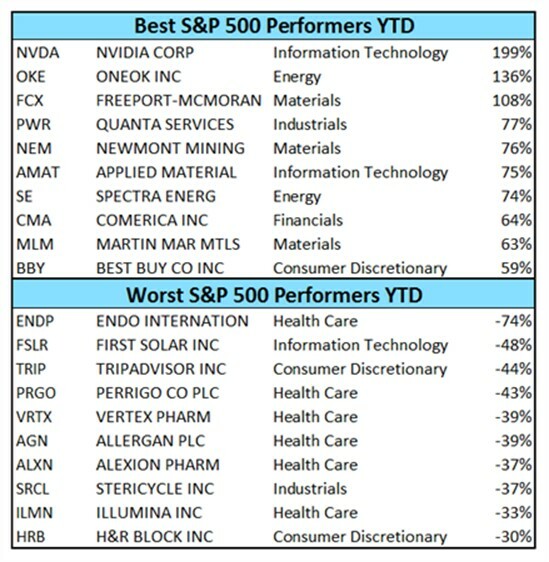 Investors who have been heavily invested in healthcare or consumer staples have likely outperformed while investors in industrials, utilities, energy and telecom have underperformed. Considering the variance in sector returns, I would expect to see a fair amount of dispersion between active managers on a year-to-date basis.